I knew that I loved Penhaligons Castile at the first spritz. Penhaligons is a beautiful, refreshing orange blossom cologne. An elegant and well-crafted neroli. It isn’t ground-breaking but it is a wonderful example of a very wearable citrus floral cologne. The opening of Castile is triumphant. It’s bitter neroli with enough greenness to remind one of sunny, early summer days before it’s too steamy hot. Wearing Castile is like being under a shade tree. To say it in the fewest words possible, the opening of Castile makes me happy. It is so well balanced. It’s less choppy and harsh than 4711. Castile wears smooth, especially for a neroli/orange blossom cologne. The blossoms are white, elegant and there is enough citrus juice in Castile to round it out. It’s one of those scents that I can’t stop sniffing. Like all neroli scents, Castile’s jubilance declines; the staying power is adequate. Castile is still a thrilling, citrus blossom heavy scent but with more spice (not foody spice, herbaceous/green spice). The spiciness and greenness of bergamot and orange tree leaves becomes more apparent. With time the dewy rose is evident. It wears so agreeable on me. It reminds me of warm Southeastern nights at this stage. The dry-down is warm and musky, like I said before. Castile wears like an EDT, so I bet in the summer one barely notices the subtle skin-like dry-down. It probably evaporated before it hits the dry-down! I’m wearing this, oddly enough, in the middle of December and I pick up on warm musk. Not a white musk or anything frou-frou like that, but something rich like a super watered down Kiehl’s Original Musk, slightly woodsy too, but not overly animalic. It’s smells like warm skin in the sun. Throughout the wear, Castile is clean and fresh and always sophisticated. You guys know I love a good neroli cologne! 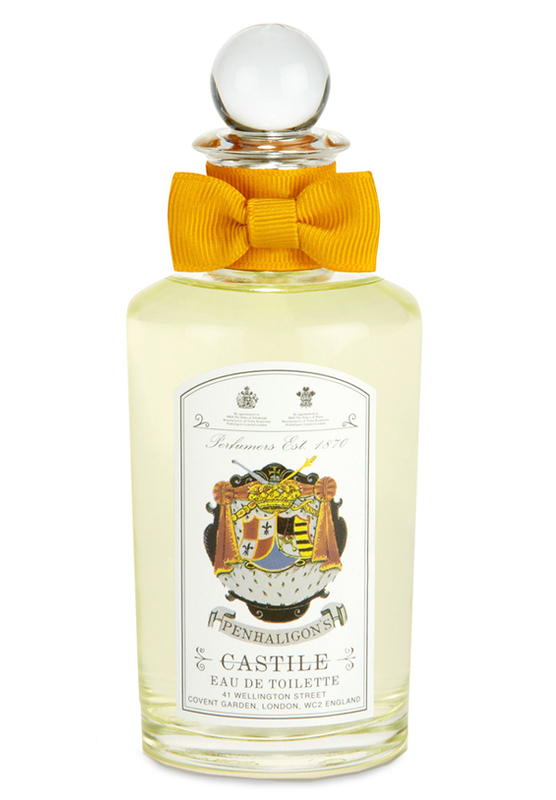 And my nose right now thinks of Penhaligons Castile as the epitome of the “good” neroli cologne! Notes listed include neroli, petigrain, bergamot, orange blossom, rose, precious woods, and musk. Give Penhaligons Castile a try if you are a neroli fan or if you like scents like Tom Ford Private Blend Neroli Portofino, Serge Lutens Fleurs de Citronnier, Diptyque L’Eau de Neroli, Annick Goutal Neroli, Guerlain Imperial, and/or Kilian Prelude to Love. A 3.4 oz bottle of Castile retails for $120 at Beautyhabit. Image by Albert Earl Gilbert “Mockingbirds on Orange Blossom”, It’s in my grandma’s “collection” and I want it. Post contains an affiliate link. Thanks! I am loving Penhaligon’s so much these days. There is so much heart in their scents, and they’re unfussy (although sometimes I like fussy, I must admit). There’s not been one Penhaligon’s scent I’ve tried and haven’t liked. I just ordered a sample of Amaranthine via Lucky Scent, looking forward to that. Penhaligon’s is an awesome house. Just like you said, unfussy and simple, well-crafted. They aren’t mind-blowing original, just well done. Hmm…evil scent twin, I don’t know 🙂 Like I told Joanne, I only started appreciating orange blossom in 2008, before then I hated all of them. I have a theory as to why they grew on me, but I’ll go into that at a later date. The problem is I like too many perfumes, too many notes. My passions change with the seasons and my many moods. My scent tastes completely changed when I moved from Nashville to Seattle. Geographic location plays a huge factor in scent preferences in my opinion. Oh, come on now with the SJP and the DK BD! I like cherry. Boom. I think it’s meant more as, two people with TASTE who like opposite things. We will either prove or disprove this theory post haste. I can see how people can like my dislikes. That’s why I like perfume. For everything I dislike, someone else loves it. It’s fun. In strange way I like cherry because it reminds me of my first car. For the exact same reason, this is why I also dislike the smell of cherry! I’m not trying to be snobby about the SJP or DKNY BD. It’s just those are the scents that are so not “me”. I can’t even wear them and fake it like I can some florals. I can see how people like them but I feel like such a poser even sniffing them! You’re snowed in? I’m so sick of snow right now. Snow is predicted for later this week, I think. I’m already longing for summer/spring scents. I’m having cravings for orange blossom and lilac perfumes! Oh my soul, this sounds like the perfect orange blossom for me. I’m just really starting to appreciate orange blossom. I like the sound of those spicy green notes! The other night, I chose an orange blossom scent to wear while I watched the film Roman Holiday, Joanne Bassett’s Petit Trianon. Such a lovely fragrance to have wafting in the air while watching Audrey Hepburn discover the beauty of Rome. I didn’t start appreciating orange blossom perfumes until the summer of 2008 when I moved out to the PNW and found out the hard way that nobody has a/c. The refreshing “cologne” perfume became my friend. This Penhaligons is lovely, so smooth if that makes sense. And the greenness reminds me of happy summer days. Sounds like you had your very own Smell-O-Vision! Perfect match for that film! I own Penhaligon’s Orange Blossom, the update released last year, and I love it. But I haven’t tried this one, it sounds good too. I like that one too, but I know that you don’t need both. I’m not saying that you won’t like Castile… I’m saying that they are similar enough. Orange Blossom comes across a bit more feminine because of the jasmine. I could see how Castile could transform into something more masculine on some skins. Reading this made me want to break out my sample of Lily & Spice, which I consider to be a masterpiece of the simple things. Even more so now that I’ve let it languish from my sight for several months. Everything languishes from my sight! How easy it is to forget even the fragrance one loves! Simple and easy to wear. I sampled and liked it to. I hope that I don’t forget about it when summer comes around. Hmm…can I do an Outlook Calender reminder for the 1st day of summer “buy Castile”, LOL. Thanks for posting this review. I saw that this was “new” on Lucky Scent and was wanting to know what it was like.